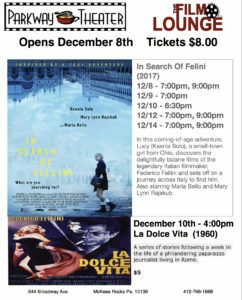 Parkway Theater presents “In Search of Fellini,” a film that follows a young woman named Lucy on her journey to meet Italian filmmaker Federico Fellini. After living an extremely sheltered life, Lucy, played by Ksenia Solo, stumbles into a screening of a Fellini film and begins to relate to the characters while becoming enthralled with the cinematic world she encounters. Deciding to take a leap of faith, Lucy travels to Rome to find the famous director. On her own for the first time, Lucy must learn to find herself while also searching for Fellini. Also starring Maria Bello and Beth Riesgraf.